This item has been discontinued by Remo. We have one left. Whistle Tambourine or Tambourine Whistle.... 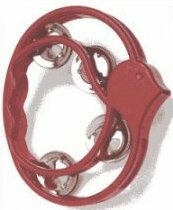 In the shape of a bird, made of durable bright red plastic, this sweet instrument is just the right size for small hands.